You are currently browsing the category archive for the ‘History’ category. I found myself up north in Casper, Wyoming, with friends for the 8/21/17 solar eclipse. We were modestly equipped for the spectacle. A member of our small group brought a Celestron 8″ Cassegrain telescope with solar filter and clock drive. We set up in an uncrowded neighborhood and began the wait. Knowing that Casper would be crowded I had arrived 2 days early to explore some of the local geology. Jeez- I guess that makes me a geotourist. This activity gives a person a mission to complete. Pick some locations to visit and go do it within your time constraints. There is a beginning, a middle, and an end. Success consists of finding the location of interest, getting samples and photographs of unique rocks, stata and general landforms. I’ve had good luck with the Roadside Geology series of books by Mountain Press Publishing. In the case of the eclipse trip, I secured a copy of the Roadside Geology of Wyoming ahead of time at a local Barnes and Noble. These books are quite well written and illustrated, especially important if you’re not packing a degree in geology. The unique value of the Roadside Geology books is that the content is divided into state regions then subdivided into stretches of highway that you can drive along. Commonly along the highway can be seen many large scale features described in the book. Even better, photographs and diagrams of road cuts are frequently highlighted. In hilly or mountainous regions there are many road cuts that allow you to view underground features. Lately I’ve taken to wearing a yellow reflective vest along the roadside while taking a close look at the exposed formation. People don’t expect to see some yay-hoo walking along the road with a hammer and a notebook as they careen around the curves on a mountain road. Best not to surprise drivers. Teapot Rock north of Casper, Wyoming. There is a bit of interesting US history attached to the geology of the Casper area. The Teapot Dome scandal erupted during President Warren G. Harding’s administration in 1922. Harding’s Secretary of the Interior, Albert Bacon Fall, was caught taking bribes in exchange for awarding oil rights to a subsidiary of the Sinclair Oil Company. The oil field was within the Navy Petroleum Reserve north of Casper. “Teapot” Dome takes its name from Teapot Rock– a formation that, at the time, had a feature that resembled a spout. This feature is no longer there. “Dome” comes from an anticline fold in the oil bearing stata below. It is part of the larger Salt Creek Oil Field. The seeing in Casper was good right up to the back third of the eclipse. The Celestron was rigged to throw an image onto a white screen. A chain of sunspots were visible early in the eclipse. As I was equipped with only my Samsung 6 for photography, I did not manage to get great pictures, nor was it really my intent. Sometimes you have to put the camera down and look. Just before totality we saw Baily’s Beads and the diamond ring. The autofocus of the Samsung was unable to produce a sharp image of the beads on the projection owing to the low light level. Close-up of sunspots early in the eclipse. When totality arrives you can look at it directly with the naked eye. It’s best to view it without the distraction of equipment. During totality it became noticeably cooler. The eclipsed sun had a wispy corona around it, reaching into space. Around the horizon back on the ground was a beautiful 360 degree sunset. People in the neighborhood were cheering. What a thing to see. Pinhole projection using aluminum foil and a cereal box. Here you can see some knucklehead trying to get a view through a pinhole projector cleverly disguised as a box of corn flakes. He commented that the image was only slightly better than nothing. In fact the image projecting through a colander onto the pavement was superior (below). Multiple images of eclipse as projected through a colander. I just have to say that in regard to the deteriorating situation with the Soviet Union Russian Federation, it does not appear that either the EU or the US have their best thinkers working on it. I think US leaders have misunderstood Putin from the beginning and I see very little to convince me that Obama’s people, the Congress, or any other high level functionaries known to me have a clue how to get their arms around Russian behavior or a workable diplomacy. Certainly recent (post-Ford) US incursions into foreign lands with troops or drones have taken us off the moral high ground in this regard. How can the US lecture Russia on the invasion of Crimea when we invaded Iraq based on lies, subterfuge, and outright errors? Bush 43 and Clinton had historical opportunities to gain better alliance with Russia. But we supported Yeltsin in the Clinton years and ignored Putin’s offers of assistance after 9/11. The Russian people were mystified when the US supported Yeltsin, widely regarded as a drunken buffoon. Gorbachev’s memoirs paint a lackluster and untrustworthy picture of Yeltsin. And the US has done nothing but confirm Putin’s paranoia about US intentions by adding membership to NATO, ABM’s in Poland, petroleum wars in the middle east, and the general appearance of weakness by in-house political fratricide. We have no use for milquetoast administrations like Obama’s, nor do we need rabid swingin’ dicks like John McCain or his hawkish brethren. We do need Russian and Slavic scholars who speak the language and understand the history of Russia at least back to Peter the Great. They can be immigrants from former Soviet territories of the ilk of Zbigniew Brzezinski, Madeleine Albright, or even a world savvy guy like Henry Kissinger. Who are the current brain trust for eastern European politics and is the CIA giving them good intelligence? Did the CIA predict the takeover of Crimea? This is an excerpt from a writing project I’m working on. The impulse to find and extract gold and silver was one of the drivers of 19th century westward expansion in North America. The discovery of gold in a California stream bed in 1849 and the subsequent discovery of gold and silver in other territories eastward to Pikes Peak and the Black Hills resulted in waves of migration of prospectors, merchants, investors, and swindlers from all directions, including Europe. The staking of mineral claims in the American west by people who were engaged in the extraction of mineral wealth lead to an inevitable avalanche of settlers interested in tapping some of the wealth of the miners themselves. The open territory created a void that was filled by industrialists, merchants, government, and perhaps most importantly, the railroad. Miners needed supplies and their ore concentrates required transportation and beneficiation. As claims were made on valuable mineral deposits, the outline of the geographical distribution of mineral value in a region eventually defined what came to be known as a district. The expansion of the railroad, sweetened by land grants, added permanence to the settlement of many regions around and en route to the mining districts. The simple logistical requirement of frequent stops to fill the steam locomotive with water lead to the establishment of towns along the railway. This expanding transportation network, along with liberal access to land, lead to settlement by farmers and ranchers who then created a demand for goods exported from long distances by rail. The history of man’s fascination with gold and other metals is well documented and there is no need to reiterate that saga in the present work. The mania for gold and silver in the west is legendary. Indeed, clues to the history of gold and silver mining in the American west are quite apparent even to the casual observer today. A drive to Cripple Creek or Central City in Colorado will take the motorist past a great many long abandoned mine dumps, prospect holes, adits, and antiquated mineshaft head works. These quiet features of the landscape mark the location of what was in times past a great and bustling industry. Throughout the American west today there are many “tourist mines” and mining museums operated by individuals and organizations who recognize the importance of keeping this part of our cultural heritage alive. Through their efforts, visitors can view 19th century mining technology on site and experience the dark and eerily silent realm of the miner. Visitors can see for themselves the intense and sustained effort required in hard rock mining and the occupational hazards miners were exposed to. The tourist mines and museums often focus on the activity of mining itself as well as the specialized equipment needed to blast the rock and muck it out of the mine. This is only natural. The gold and silver rushes left behind a large number of artifacts. These items are of general interest to all. The technology that is often glossed over relates the matter of getting the pay out of the pay dirt. Indeed, this is a central challenge to gold and silver extraction. Once the streams have been depleted of placer gold and the vein or lode has been discovered somewhere up the mountainside, the business of extracting gold or silver from hard rock becomes technically much more challenging and capital intensive. The panning and sluicing of placer or alluvial gold, while labor intensive, is conceptually easy to grasp. High density gold particles can be transported by suspension in a water slurry of the water is moving sufficiently fast. Gold particles will tend to settle at low points in a crevice or a gold pan where the stream velocity slows. A gold pan or the bend in a stream for that matter will have a flow gradient that will tend to collect the gold particles where the stream velocity slows. A sluice or a Wilfley table are just devices designed to trip laminar fluid flow by inducing turbulence to encourage the denser gold particles to settle. Riffles or channels serve to concentrate the gold particles. While gravity and clever tricks with fluid flow can be used to collect placer gold, isolating gold or silver from a hard rock ore body is quite a different challenge. Gold and silver may exist in reduced form within the ore. They may also be found alloyed with one another or otherwise combined with other heavy elements. While gold tends to be inert even under oxygenated conditions near the surface, silver is subject to more facile oxidation and may be found in ionic form with several anionic species. Thus technology for the isolation of gold may not serve as an exact template for silver extraction and isolation. Gold or silver may exist in the metallic form as bodies visible to the naked eye within the solid rock. Or they may be dispersed in microscopic elemental form throughout the ore body. Gold ore may be rich in elements that complicate its isolation even though the gold is in reduced form. Silver ore is commonly found in ionic form and with numerous ionic base metals present. Lode gold or lode silver, that is, gold and silver found dispersed in an ore body, were subject to considerable variation in mineral composition. As a result, differences in isolation techniques and process economics arose among the various operations. In the 19th century a considerable body of chemical knowledge evolved as the gold and silver rushes progressed. This chemical knowledge was put into practice largely through the efforts of mining engineers. It was not uncommon for the mining engineer to conceive of what today would be considered a process chemistry change, draw up plans, press the ownership for funding, and put the change into operation. Twenty-first century chemists may recognize much of the nomenclature from this period as well as the intended inorganic transformations. However, the older literature is filled with obsolete nomenclature or that which is confined to the mining industry. What should be apparent to the observant reader is the level of sophistication possessed by 19th century metallurgists and engineers in what chemists today might refer to as the “workup”. That is, the series of isolation steps used to remove undesired components to afford a reasonably clean metal product. Mining engineers refer to this as beneficiation or as extractive metallurgy. Beneficiation of lode gold and lode silver involved chemical transformation in batch or continuous processing. The story of the development of extractive metallurgy is in part the story of redox chemistry on complex compositions like rock. In the mid 16th century Europe, key individuals like Biringuccio, Agricola, and Ercker began to capture mining and extractive metallurgical technology in print. Vannoccio Biringuccio (1480-1539) published his De la pirotechnia in 1540, detailing economical methods of metallurgy and assaying. In 1556, the work of Georg Bauer (“Agricola”, 1494-1555) was published posthumously. His De re metallica is regarded as a classic of metallurgy. Agricola’s book describes the practical issues related to mining, smelting, and assay work and is illustrated with remarkable woodcuts. By the year 1520, do-it-yourself books like Ein nützlich Bergbüchlein and Probierbüchlein were beginning to appear in Europe describing basic mining and metallurgy techniques. By this time methods of cupellation and the separation of gold and silver were committed to print. Cupellation is an assay technique wherein crucibles made of bone ash were used to fire prepared gold ore samples with an oxidizer, affording base metal oxides which then separated from the gold and absorbed into the crucible to afford an isolated button of gold. Aaron J. Ihde, The Development of Modern Chemistry, 1964, pp 22-24; Dover Reprint 1984, QD11.I44, ISBN 0-486-64235-6. Blogopithocene Man Smelts Tin. Meh. The problem of the origin of Cu:Sn bronze has intrigued historians for many years. Bronze artifacts have been dated to 5000 BCE on the Iranian Plateau. It is thought that the earliest bronzes were arsenical in nature. The presence of arsenic in copper metal or copper ore is not uncommon. Copper can be found as the native metal but the smelting of copper ore appears to date back to ca 5000 BCE in southeastern Europe in what is now Serbia. Most commonly today, the word bronze refers to a range of copper alloys comprising various proportions of copper (major, e.g., 88 %) and tin (minor, e.g., 12 %). As the tin content increases, the resulting alloy changes properties and may have a unique purpose and name. For instance, a ratio of ca 2:1 :: Cu:Sn is called speculum and was prized for it’s ability to take a high polish for mirror applications. Further down the composition range are varieties of pewter which are alloys comprised substantially of tin and a few percent of copper and antimony for hardening. Many specalized compositions of pewter have been developed. Britanium or Britannia metal is an alloy comprised of 93 %Sn, 5 % Sb, and 2 % Cu. This alloy serves as the base metal Oscar Award Statue upon which gold is plated. Pewters composed of Sn:Pb were commonly used as well. Tin is not found in the metallic state in nature. It is oxophilic and occurs primarily as the tin (IV) oxide mineral, cassiterite. Tin ore was mined in Cornwall, England, for instance, for many centuries before recorded history. Today, most of the worlds tin comes from Asia, South America, and Australia. The jump to “engineered” bronze was a step change that involved the reduction of a tin mineral either in situ with copper or in isolation to produce discrete tin. It is thought that polymetallic copper ores were smelted, producing Cu:Sn bronze directly. Eventually, tin ore was identified as a source of smeltable metallic tin. Why anyone would think to apply reduction conditions to a mineral as seemingly featureless and uninteresting as cassiterite is an intriguing question. Below is a photo of the result of my first attempt at smelting a cassiterite simulant (SnO2, Aldrich). The SnO2 was treated with carbon black at 900 C for 4 hours in a covered porcelain crucible in a muffle furnace. After a failed attempt with a large excess of carbon, the ratio was reversed and heated for a longer period. For the illustrated sample, the mass ratio of SnO2 to carbon black was ~2:1. All of the carbon black was consumed, leaving a white mass of needles on the granular solids. 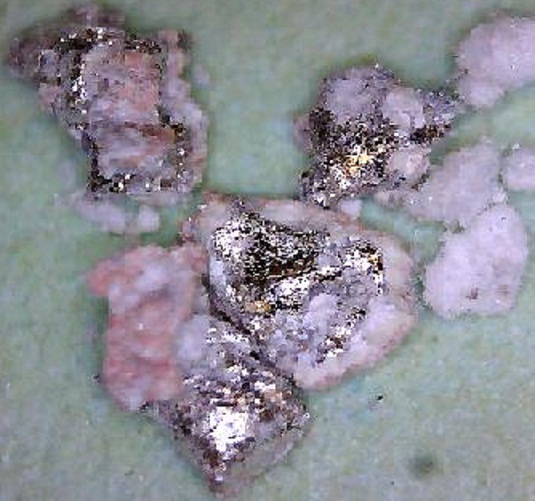 Using a USB microscope I searched for evidence of reduction to the metallic state and found numerous examples of sub-millimeter sized pieces of metal. The yield of metallic tin is estimated at < 1 %. The purpose of this exercise (for me) is to try gain a better sense of what problems people might have faced smelting tin in antiquity. Using basic principles, I strongly heated the SnO2 under reducing conditions until the carbon was consumed. What I did not expect was the large amount of white crystalline material produced. It’s composition is as yet unknown to me. Next I will make some charcoal or even wood shavings as a reductant for authenticity sake. Who knows, maybe some carbon monoxide generation might be helpful. The muffle furnace does not simulate a reverberatory furnace very well. It could be that gases from a reducing flame are important. It is a misconception that renaissance alchemists were only concerned with the philosophers stone. Hermetic alchemy was an overlap of alchemical practice within a mystical or spiritual framework. This branch of alchemy and its practitioners are perhaps better known in the popular literature than the alchemists who might be regarded as more pragmatic experimentalists. Many alchemists over history were very practical and quite occupied with their trade in medicaments, tinctures, distillates, and elixirs or with metallurgical and compounding endeavors. Paracelsus is regarded as an early practitioner of iatrochemical work, but within a hermetical framework. Agricola and Biringuccio were 16th century chroniclers of metallurgy that had a basis in earlier alchemical progress. Consider an entry from a translation of The Laboratory, or School of Arts; in which are faithfully exhibited and fully explain’d, I. A variety of curious and valuable experiments in refining … VI. A dissertation on the nature and growth of saltpeter; … Translated from the German, by Godfrey Smith, published 1738. In this volume, available from ECCO, Eighteenth Century Collections Online, contains a passage under the heading of “To prepare Aurum Fulmina__s” (two letters obscured). I have retained the archaic character “f” in place of “s” for the reader to enjoy. It seems likely that the worker is trying to refine the gold by dissolution of the Sb/Au blend by complete dissolution in aqua regia, followed by what we would now regard as a reduction of the gold solution. Quenching the aqua regia would be expected to cause the gold to reduce and fall out as the native metal. But gold chemistry is not what is interesting in this account. The Spirit of Sal Ammoniac, meaning either ammonia itself or ammonium chloride, would do as follows: the ammonium would ion pair with nitrate and, upon drying, leave a residue of ammonium nitrate, which is an explosive. Simple open burning of small kernels material enriched in ammonium nitrate might be expected to deflagrate or pop, as indicated in the end of the description. The Oil of Tartar, however, might have an altogether different fate when dissolved in aqua regia. Oil of Tartar is a concentrated aqueous solution of potassium (or Na) tartrate. In solution with aqua regia, one would reasonably expect the two hydroxy groups of tartaric acid to form the dinitro ester if appropriate nitrating species are present. A nitrate ester group is a common explosophore and consists of O2N-O-C comprising an oxygen linkage between NO2 and carbon. This linkage is sensitive to low levels of stimulus, making compounds with such linkages susceptible to rapid or explosive decomposition. The nitrite ester is listed as an explosophore as well. The nitration of tartaric acid is described in US patent 1,506,728. This patent teaches the use of the standard H2SO4 catalyzed HNO3 nitration of the tartaric acid diol functionality to form a dinitro ester via the standard nitronium ion formation. In the case of aqua regia, the presence of NO2(+) is questionable. Aqua regia is known to produce nitrosyl chloride, ClNO which dissociates to Cl2 and NO. Literature on the nitration of alcohols to nitro esters in aqua regia is non-existant in Chemical Abstracts. There are a few citations describing aromatic nitration by aqua regia, but no clear description of nitro ester formation. Indeed, there are many descriptions of direct extraction of gold from aqua regia using isoamyl alcohol with no warnings of explosive or nitro formation. There are, however, reports of the use of ClNO to produce organonitrites when reacted with a monohydroxy alcohol (Journal of the American Pharmaceutical Association (1912-1977) (1932), 21, 125-8). It is possible that a tartaric nitrite was formed which may be energetic to some extent. But perhaps the application of Occams Razor is needed. Potassium or sodium tartrate would be mildly basic and upon addition to a mineral acid solution, it would neutralize the acid in sufficient quantities, affording potassium or sodium nitrate (saltpeter). On evaporation of water, the saltpeter residues would be comingled with tartaric acid, comprising a fuel/oxidizer mixture. Small quantities of crude nitrate esters, nitrite esters, or nitrate salts could have been present in the dried paste, giving the pyrotechnic effect described. The formation of energetic materials was not the primary purpose of the procedure, although the observed behavior of the residues was apparently compelling enough to document. Huo Yao (Fire-Drug)- Predecessor to Gunpowder. Recently I spent some time tracing the very early history of gunpowder or Huo Yao (China, ca 850 AD). It turns out that the earliest clear description of a gunpowder-like composition was described in a document produced during the Tang Dynasty. A document titled “Classified Essentials of the Mysterious Tao of the True Origins of Things” contained a list of particularly dangerous elixirs. A comprehensive history of Chinese science can be found in “Science and Civilisation in China, Volume 5: Chemistry and Chemical Technology, Part 4, Spagyrical Discovery and Invention: Apparatus, Theories and Gifts” by Joseph Needham. Within this list of hazardous compositions, a warning was offered citing the dangers of mixing and heating together realgar, salt peter, sulfur, and honey. The document tells of alchemists mixing this combination and heating it resulting in a deflagration leading to burnt beards, faces, and hands as well as the loss of the structure to fire. This mixture has been translated as “fire-drug”. There are earlier references to admixtures that could produce a violent effect, but the compositions are not disclosed. The information in the 850 AD document clearly describes the components of classic gunpowder- a nitrate oxidizer, sulfur for low ignition temperature, and a carbohydrate reducing agent- honey. What is notable about gunpowder is that is a self-contained redox system containing two sides of the fire triangle– fuel and oxidizer in intimate contact. All that is needed for an exothermic reaction is initiation with some kind of stimulus. A couple of thoughts on the realgar present in the mix. First, alchemists were commonly in the apothecary trade and made their living preparing medicaments. It is not unreasonable to suppose that the composition was intended for some medicinal effect. Realgar is tetraarsenic tetrasulfide (As4S4) and may have been a common apothecary ingredient of the time. Crystalline realgar is a ruby-like, eye-catching substance and it is not surprising that it captured the fancy of alchemists. Second, realgar is found in hydrothermal deposits as are copper, gold, silver, and mercury sulfides (also called a sulphuret). Back when roasting ore was widely practiced (and legal), it was common for miners to heap sulphuretted ores onto a wood pile and set it alight directly or oxidize it in a reverberatory furnace. This process would actually ignite the sulphureted ore and in the case of gold and mercury, release the native metal. The point is that sulphuretted arsenic would be expected to contribute in the deflagration process as a nitrate reductant or as a spectator fuel. Vannoccio Biringuccio. Sixteenth Century Chronicler of Metallurgy. By the early 16th century in Europe, metallurgy had become an established cottage industry in numerous locales. Artisans were sourcing copper, tin, zinc, antimony and iron ores for reduction, refinement and alloy production for cannon and bells among other products. While there was no systematic science of chemistry in a form recognizable today, the necessity of constant proportions was understood and exploited to maximize the efficient use of scarce materials. Metallurgists of the 16th century would no doubt share the enthusiasm of developing technology with the same fervor as the technologists of today. Unfortunately for these 16th century technologists, the contribution of centuries of alchemy produced a confusing array of occult-based practices. These alchemical practices were based on Aristotelian notions of material “qualities” rather than a system of quantitative relationships of and between substances. It is thought that alchemy began with Grecian metalworker’s practical knowledge of metal preparation. Inevitably, this practical art was overprinted with a thick layer of theological mysticsm by the end of the first millenium. By the end of the alchemical age, any systematic theories of matter were blended into a Mulligan stew of early Roman Catholic mysticism, incomprehensible nomenclature, and the false choices set forth by Aristotle in his theory of matter. Fortunately for 16th century practitioners of the metallurgical arts, several encyclopedic works were published detailing the practical art of smelting and casting of metals and what we now know to be alloys. A prominent early work published in 1540 was the Pirotechnia by Vannoccio Biringuccio (1480-1539). Born in Siena, Italy, over the course of his life Biringuccio traveled extensvely throughout Italy and Germany. His Pirotechnia is a series of books and chapters detailing foundry techniques that he witnessed first hand throughout his travels. He made every attempt to describe methods and techniques in enough detail to accurately capture the technique in question. Above all, he completely drops all the alchemical mysticism and bases his comments on process oriented details such as measured proportions and processing conditions. Up to this point, what was missing from this very early form of chemistry was a systematic collection of facts and measurements and an accurate chemical model in which to give the facts meaning and predictive value. Biringuccio, and later Agricola, would begin the disengagement of alchemical mysticism and provide a basis of metallurgical technology upon what might be called science. In a real sense, this helps to set into motion the western industrial revolution. Metallic goods would be produced by very pragmatic artisans who would continue to improve their art through the application of rudimentary measurement. While it would be four centuries before atomic theory would be developed to make sense of the manner in which definite proportions operated, systematic methods of assay would begin to appear well before atomic theory. The ability to identify value in ores and quantitate it allowed the mass industrialzation of metals. The extraction of silver and mercury in Spanish new world was central to the expansion and upkeep of the empire. Silver provided wealth enabling the crown to project power and pay its debts. In the early years of the conquest the Spanish pilfered and exhausted Inca gold and silver available in stores and caches. Eventually, the Spanish found deposits of gold and silver and developed a form of forced mine labor (mita) wherein indian families were required to provide a worker for one year’s unpaid labor in the mines. The Viceroyalty of New Spain and the Viceroyalty of Peru during the age of conquest developed many mines, yielding mostly silver. Many deposits, especially Cerro Rico in what is now Potosi, Bolivia, contained silver in the metallic form to some minor extent. The Incas had developed smelting before the Spanish occupation, but the process was inefficient and required fuel for smelting. Wind smelting was developed by the Incas, but was dependent on the winds to drive the fires. The discovery of amalgamation and recovery of silver and gold by retorting solved many problems in production. After the discovery of the patio amalgamation process in 1554 in what is now Mexico, the importance of mercury was recognized as the key to efficient, large scale silver production. This discovery eventually enabled the large scale enslavement of aboriginal peoples to run the mercury mines and smelters of Huancavelica, Peru, and amalgamation operations in the many silver mines in the region. We found these kingdoms in such good order, and the said Incas governed them in such wise [manner] that throughout them there was not a thief, nor a vicious man, nor an adulteress, nor was a bad woman admitted among them, nor were there immoral people. The men had honest and useful occupations. The lands, forests, mines, pastures, houses and all kinds of products were regulated and distributed in such sort that each one knew his property without any other person seizing it or occupying it, nor were there law suits respecting it… the motive which obliges me to make this statement is the discharge of my conscience, as I find myself guilty. For we have destroyed by our evil example, the people who had such a government as was enjoyed by these natives. They were so free from the committal of crimes or excesses, as well men as women, that the Indian who had 100,000 pesos worth of gold or silver in his house, left it open merely placing a small stick against the door, as a sign that its master was out. With that, according to their custom, no one could enter or take anything that was there. When they saw that we put locks and keys on our doors, they supposed that it was from fear of them, that they might not kill us, but not because they believed that anyone would steal the property of another. So that when they found that we had thieves among us, and men who sought to make their daughters commit sin, they despised us. Many Spaniards attempted to speak out for the Inca and other aboriginals. Few were effective. But by the time of the Fifth Viceroy of Peru, Francisco Alvarez de Toledo, it was recognized (by Toledo, at least) that reforms were needed to bring the Inca into Christianity and life in a world of laws. Perhaps it was unfortunate for 16th century Incas that King Phillip II was an especially enthusiastic proponent of the counter-reformation and the Inquisition. In his 1736 publication Smegmatalogia, or the Art of Making Potashes and Soap, and Bleaching of Linens, James Dunbar describes a process for the preparation of potash. The intended user of the process was the common Scottish farmer. Dunbar was anxious to imbue the common Scot with the ability to “bleach” his own linens. It is important to realize that the meaning of the word bleach in the early 18th century is different from contemporary use. The modern use comprises notions of decolorization through oxidation of color bodies to produce a white appearance. The 18th century concept involves the apparent cleansing and subsequent lightening of a fabric. The book begins by detailing the preparation of a solution or extract from ashes called Lee. To obtain this solution, the “Country-Man” would carefully collect Scottish vegetables such as the wood of oak, ash, beech, “thorns”, juniper trees, and “whins”. Suitable herbs included fern, breckens (or brackens), wormwood, thistles, stinking weed, and hemlock. Dunbar is careful to instruct that the vegetation should be burned in the shelter of a house but in such a way as to avoid burning down the house. The purpose of burning the vegatation in a shelter is to avoid having rainwater come into contact with the ashes. My interpretation of this is that runoff carries away soluble potash. The ashes are placed in a container and covered with water. The ashes are soaked in water until such time that the Lee “carries an egg on its surface”. What Dunbar is telling us is that the extraction of the ashes needs to go until the worker obtains in the solution a particular specific gravity- this is a specification. There is some minimum specific gravity of the Lee that will float an egg. And the higher the specific gravity, the more volume of the egg rises from surface of the Lee. The specification herein is required for the next operation. In order to carry out a successful saponification of tallow, the Lee solution must be sufficiently concentrated. Dunbar then describes steps where the Lee is combined with the ashes of ash, beech, or fern followed by boiling the water off to afford “thickens of pottage“. The residue is shaped into balls which are then calcined in a fire to afford a substance that may be stored in a dry container for the purpose of making soap. The discovery of chlorine in 1774 by Scheele and the subsequent of discovery of chlorine bleaching by Berthollet gave us our modern conceptual notion of bleach and bleaching. The develoment of bleaching powder was made by Scottish chemist Charles Tennant who took a patent in 1799. Tennant’s associate, Charles MacIntosh, is thought to be a contributor to this invention. Bleaching liquors and powders soon became an important raw material for the bleaching of paper and fabric. The procedure described by Dunbar is a chemical process. It tells the user when the extraction is complete, qualitatively at least, by a folksy means of specific gravity determination. This is really very clever- it uses a common object to do the test and the result is readily apparent. Bleaching in the early 18th century involved the use of soaps and of urine treatment and bleaching fields- a far cry from what we now think of as bleaching. We tend to think of some things as being relatively new. I’m thinking of the gas and oil extraction technique of fracturing, or fracking. In the 1884 third edition of The Modern High Explosives, Nitro-glycerine and Dynamite by Manuel Eissler, p 311, there is a mention of the practice of exploding nitroglycerine charges at the bottom of oil and water wells to renew or increase the flow. The author states that this is a popular technique in Pennsylvania at the time of writing. On p 318 of the same book, Eissler describes the economics of blasting stumps. In general, the process of removing stumps was called “grubbing”. Enterprising fellows knowledgeable with nitroglycerine took little time in applying the explosive power of this oily liquid to clearing the land of stumps. Eissler describes the economics of explosive grubbing as follows: Three pounds of No. 1 dynamite cost $1.50, labor cost 20 cents per hour, 25 ft of fuse cost 1 cent per foot, and 17 percussion caps cost 1 cent each. Grubbing 17 oak stumps cost $22.52 with 99 man hours for chopping and piling the pieces. Grubbing with an axe took 142 man hours and cost $28.40. No. 1 dynamite was comprised of 75 % nitroglycerin and 25 % absorbent. “that it appears to include the elements of thunder in its particles; and Nature seems to have concentrated all her powers of detonation, fulmination, and inflammation in this terrible compound”. Eissler goes on to say that attempts to prepare gunpowder or blasting powder with potassium chlorate lead only to loss of life and limb for the luckless experimenters with this compound. Two of Bertholet’s artisans employed to do experiments with this material were killed in 1788. The hazards associated with both manufacture and use of compositions of potassium chlorate were too great to allow this substance to see much commercial application by the 1880’s.